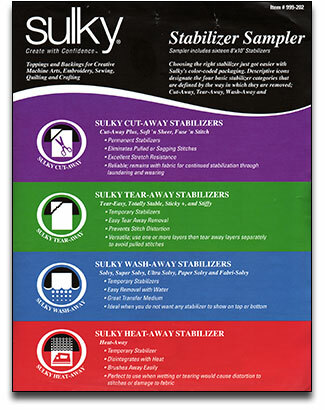 For more information or complete use instructions, click on any Sulky stabilizer brand name. Cut-Away, Tear-Away, Wash-Away and Heat-Away. This Stabilizer Sampler Pack is a wonderful teaching tool and is also the perfect way to purchase all the Sulky Stabilizers very inexpensively. Then you can choose with confidence just those stabilizers that work best for you. Sulky Stabilizers are made using a combination of the most advanced technology and the highest quality, fiber-based materials. All are acid-free and lead-free. No other Stabilizers have more fibers per square inch. All Sulky 8", 12" and 20" rolls are packaged in a reusable storage container to keep them fresh and usable for years. All Sulky Stabilizers have color-coded packaging and icons to help you choose the right Sulky Stabilizer for each of your creative projects. Clear, easy-to-understand directions in every package assure success every time. For almost 30 years, millions of consumers have relied on the uncompromising quality of Sulky products.